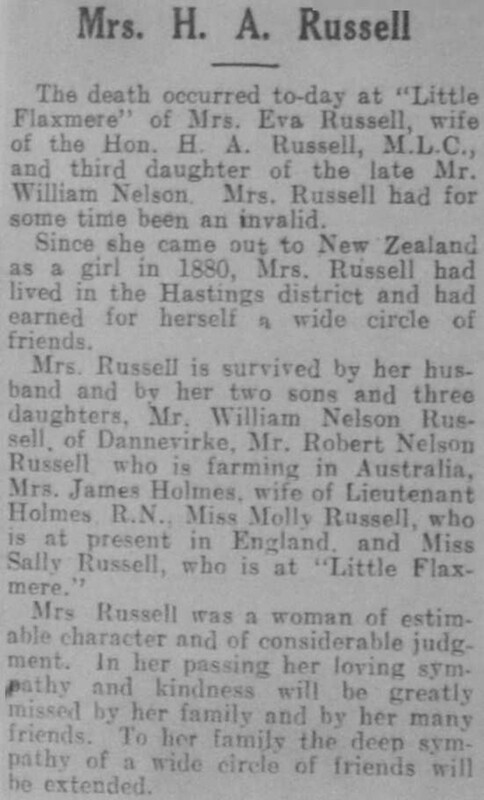 The death occurred to-day at “Little Flaxmere” of Mrs. Eva Russell, wife of the Hon. H. A. Russell, M.L.C., and third daughter of the late Mr. William Nelson. Mrs. Russell had for some time been an invalid. Since she came out to New Zealand, as a girl in 1880, Mrs. Russell had lived in the Hastings district and had earned for herself a wide circle of friends. Mrs Russell was a woman of estimable character and of considerable judgement. In her passing her loving sympathy and kindness will be greatly missed by her family and by her many friends. To her family the deep sympathy of a wide circle of friends will be extended.